Revenue from gaming contributed by Downtown Las Vegas, Nevada market was off by 6.2 percent in February, a decrease of $50.7 million. The Lady Luck Casino closed for remodel in February 2006 with an expected reopen in 2008. This attributed to the monetary decline from Downtown gaming for nine months. The Strip boosted it profits from a 3.5 percent decline in January and a 23.4 percent increase in December. 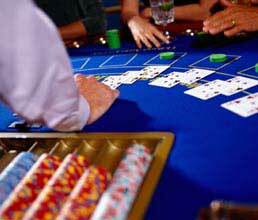 Overall, Nevada’s gaming revenue was up. North Las Vegas had a decrease of 5.8 percent: $24.8 million, Boulder 3.59 percent: $72.5 million, Laughlin 2.5 percent, $56.2 million, Carson Valley 4.25 percent: $9 million, and Reno 5.6 percent: $57.9 million. Mesquite had an increase of revenue to $16.2 million or a 26.8 percent increase. 7.5 Percent or $1.06 billion, of the total money wagered in February 2007, was lost by gamblers of the total $14.1 billion revenue. 78 percent of this went into the very popular Vegas slot machines. Source: Globe St.
Las Vegas gaming revenue increased with money from the NBA All Star game.